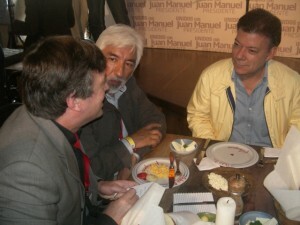 Juan Manuel Santos during his first presidential campaign in 2010. Was Santos at that time thinking it possible of starting a peace process with the FARC? © All rights reserved. It appears to be that the odds are heavily against an overall complete peace agreement being signed between the Colombian government and FARC by March 23, from where things stand now and as I predicted earlier in my reports to US officials, basing my assessment on what the FARC leadership has told me and from its public pronouncements, as well as from my talking with others and just looking at time-tables, practicalities and limitations. Colombia’s Pres. Juan Manuel Santos has insisted that March 23 is the orally agreed “deadline” between him and the FARC’s maximum leader “Timochenko” from when they met September 23, 2015 in Havana for a high-profile televised ceremony where they signed in the presence of Cuban leader Raul Castro what was supposedly a completed agreement on victims’ and judicial issues, but which turned out to not be really completed, as shortly afterwards both sides talked of “imprecisions,” voids and differences of interpretation that still needed to be “polished” and resolved. But the FARC leadership has maintained that March 23 was a then-hoped-for target date to end a six-month time-frame that was to begin once the victims’/justice agreement was completed, and since it wasn’t completed on September 23, as first misunderstood, the clock didn’t start, according to the FARC. The Colombian government and FARC peace delegations jointly announced Dec 15 in Havana that impasses in the victims’/justice agreement’s 75 items were worked out, but a careful reading of it shows that some things are still to be determined later. So, has the clock started or not? It is interesting to note that while Pres. Santos hasn’t ditched his view of the March 23 “deadline,” he had inserted more since the beginning of the year an “ojala” (“it is wished”) caveat in his public comments about the March 23 date, emphasizing the sensitive complex nature of questions that remain in the “final stretch.” And Pres. Santos has indicated that if his view of the “deadline” isn’t met, he will not end the talks. “We hope to sign before the 23 of March. If it is a couple of days or a week later, no matter,” Santos was quoted as saying at the Wilson Center in Washington DC February 3, by Colombia’s largest newsmagazine SEMANA. Pres. Santos was referring to the following four points: 1) the timeline for the FARC to lay down its weapons; 2) how to select the judges for the tribunal on war crimes; 3) where and in how many areas to gather the guerrillas for demobilization from its guerrilla form; and 4) the way to ratify an eventual overall peace accord. If the talks drag on after the March 23 “deadline” is Pres. Santos prepared to say something like, “Hey, I tried my best, I tried to go the extra kilometer, and I don’t see the necessary progress, and Colombians’ patience has run out, and I am recalling my negotiating team from Havana”? Could Pres. Santos’s statement February 19 that the “time has now run out for finishing the negotiations” be laying the possible groundwork to end the talks? Or will Pres. Santos let “deadlines” come and go with no overall peace accord signed and continue to allow things to drag on, in his heart-felt hopes for peace? The odds are that as long as Pres. Santos sees meaningful progress and that there are realistic signs that an end is truly in sight, he will be pragmatic and continue the talks and not let the technicality of missing a date throw about three-and-a-half years negotiations overboard. Pres. Santos’ heart and hopes were put into setting the March 23 date with “Timochenko” as what Santos might have thought could be an effective, bold way to try to expeditiously flow the FARC into an overall peace agreement. Ironically, while the FARC leadership sometimes has wondered if Santos’ insistence on the March 23 date is a tactic to try to corral or corner the FARC, some observers ask, Did Santos corner himself on this one? Santos would answer no and that he got “Timochenko” to make a time-frame, and that the FARC didn’t keep it, whatever the reason (if the March 23 date isn’t met). Nevertheless, the unfulfilling of the March 23 date could spur questions—stoked by the political opposition and other critics–about who is in the driver’s seat when it comes to the pace and direction, perhaps, of the peace talks: The Colombian government or the FARC? Without an overall peace accord signed by March 23, Pres. Santos could argue that he and his negotiating team tried their best, stepping on the accelerator, and that the elapsed “deadline” prodded further progress faster, but that more time is needed to get closer to the finish line. Critics may argue that it prodded movement, but in the form of too many concessions by Santos to the FARC on the victims’/justice agreement, among other things, which Pres. Santos would deny. While the odds for an overall peace accord by end of 2016 are better–at least relatively speaking–it is not guaranteed and would seem to be a tough uphill effort. The FARC has been clear that it has no problem in “taking the time necessary” until it is satisfied with a text. And FARC peace negotiators have said that the Colombian government peace delegation has taken its own time, for example, by being too much of a stickler at times, in the FARC’s view, to the point of where to place commas. Where to place or omit a comma could change the meaning of a phrase, and it is just an example of how details dictate time. But odds of an overall peace accord happening in 2016 would be boosted by a lot of hard work, focus, and intelligent, sensible, responsible and creative thinking, and if miscalculations, misreadings and other potential pitfalls are avoided. Perhaps inadvertently telling, the Colombian government-FARC agreement on the United Nations and CELAC to participate in verifying an eventual bilateral cease-fire states that the time-frame for the verification mission is 12 months and extendable. So, what does that seem to imply? That things could go into 2017 or after? As European Union Special Peace Envoy Eamon Gilmore said in a Colombian press interview, it is better to focus on getting a good, solid deal than on fixating on a particular date to get it. Slap-dashing together an agreement just for the sake of doing things fast would not be conducive to making a very good, solid, responsible, stable, lasting overall peace agreement. If 2017 arrives and there is no overall peace agreement, then politics for the 2018 Colombian presidential and Congressional elections will kick in substantially (there is already presidential electoral jockeying now), and that could affect the peace process–perhaps even up to the point of where pressures would mount on a lame-duck Pres. Santos, who Constitutionally cannot run for a third term, to pass the peace negotiations on to his successor, who would decide on what to do with them. At that point, who knows what Colombian public opinion and patience would be on the talks? But it isn’t far-fetched to think that if the FARC continues to effectively hold to a cease-fire (unilaterally now, though perhaps bilaterally by then, if the Colombian government agrees and if the UN wouldn’t object to its verification mission starting before an overall peace accord is signed), the patience of many Colombians with the peace process could continue, even into a new presidential administration. (The FARC says that its unilateral “indefinite” cease-fire depends on it not being “provoked.”) Would Pres. Santos end the talks just because he would have to hand them over to his successor? No. As Pres. Santos has publicly said, as long as he sees good faith and significant progress in the talks, he will continue with them in his heart-felt quest for peace. Jonathan Powell—who as chief of staff to British then-Prime Minister Tony Blair worked in an important role on the Northern Ireland peace accord and who is now an adviser to Pres. Santos–observed in a January 10 Colombian El Tiempo newspaper interview that the final part of a peace process can be the toughest part. And tough can mean time-consuming. While the FARC’s chief peace negotiator “Ivan Marquez” announced that the chances of peace are now shinier than ever, “Marquez” tempered his statement by stressing that there is a lot of nitty-gritty to be tackled in what remains to be negotiated. Clear, straightforward communication is a must, not only between both sides, but within each side’s respective negotiating structures, and with the general public, to protect the talks from possible misunderstandings, false expectations, unrealistically high hopes, unfounded rumors, misinformation, disinformation, trouble-making or flat-out smears. And what needs to be recognized is that trying to fit solutions to a remaining host of thorny, very complex and sometimes seemingly paradoxical issues within a year would be like trying to get a Christmas tree through a not-big-enough door. Working the angles right, squeezing, and pushing enough, the tree might be able to be crammed through, but it’s a maybe. In April 2013, during my first of 11 trips to Havana to talk with the FARC leadership about the peace process, “Ivan Marquez” told me that once the judicial and political participation issues were resolved, the most difficult humps would be crossed, and the peace process could move faster. But that doesn’t mean that everything else would be necessarily finished in months. Besides the still-to-be-determined aspects in the victims’/justice agreement, other complicated issues include, but are not limited to: the FARC’s insistence on resolving the phenomenon of “paramilitarism”/vigilantism; an eventual “definitive” bilateral cease-fire/cessation of hostilities; the gathering of FARC forces for eventual laying down of weapons and entry into legal society (the FARC says that the word “demobilization” isn’t accurate because the FARC intends to stay organized, albeit unarmed then); FARC incorporation into electoral politics; the ratification, implementation, and verification of an eventual overall agreement, etc. And it must not be forgotten that the FARC says that at least 42 tough “loose ends” left “in the freezer” since the start of the formal peace talks in the autumn of 2012 are yet to be resolved from partially agreed-to points on agrarian/land/rural development, political participation, and narcotics/alternatives to illegal crops. Moreover, the FARC leadership says that it will not forget “Simon Trinidad” and other FARC members extradited to US prisons serving sentences on kidnapping, drug-trafficking or other criminal charges. For example, just alone on the issue of the paramilitary phenomenon, a member of the FARC’s top level, the Secretariat, in this case “Joaquin Gomez,” says, “The state must resolve the phenomenon of “paramilitarism” before an overall peace agreement is signed. This statement may be seen by some to imply that the Colombian government first dismantle all of the organized criminal bands known as “BACRIMs,” which are viewed by the FARC as a continuing form of “paramilitarism” after the demobilization a decade ago of traditional anti-guerrilla outlawed “paramilitary”/vigilante groups, like the United Self-Defense Forces of Colombia (AUC). This couldn’t be done in a year, and probably not in several, or ever at all in totality. Another FARC Secretariat member/peace negotiator, “Pablo Catatumbo” says that this doesn’t mean that every single “paramilitary”/BACRIM/post-“paramilitary” member has to be dealt with, but that the Colombian government has to subdue the structures of “paramilitarism” to a point where they are not a threat.